This microscopic diplonemid doesn’t look like much, but it’s one of the most abundant single-celled hunters in the ocean. Researchers from the University of British Columbia have become the first to identify and photograph this surprisingly elusive—but ecologically important—sea creature. Despite their abundance, diplonemids have been largely overlooked by marine biologists. Which is understandable once you realize these tiny critters are about one hundredth the size of a pinhead and basically transparent. 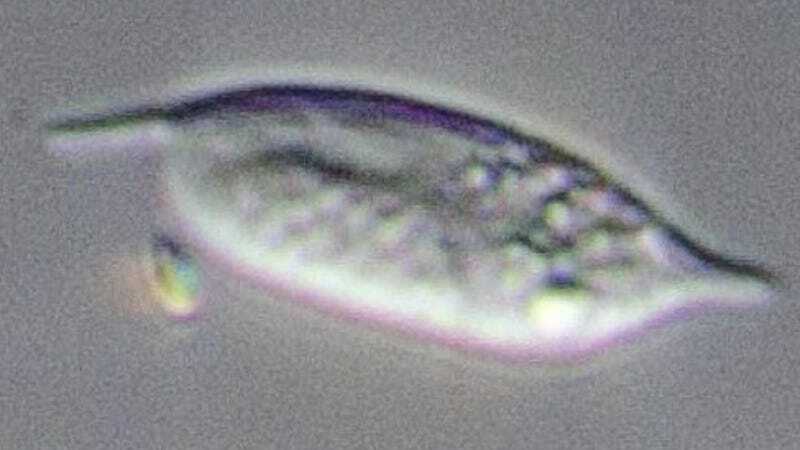 Biologists started to take notice once surveys began to show that diplonemids are the most abundant protozoa in the ocean, a diverse group of single-celled organisms that excludes bacteria and viruses. Despite their prolific nature, these free living creatures had never been captured or observed directly in the ocean. A new study published in the journal Current Biology is the first to correct this omission, showcasing the first photographs ever taken of marine diplonemids, as well as including a genomic analysis. A research team led by UBC’s Patrick Keeling, along with help from the Canadian Institute for Advanced Research (CIFAR), collected the specimens off the coast of California in deep waters. Given their microscopic size and vast environmental niche, these creatures likely number in the trillions (if not more). They have a highly active metabolism, and they predate on algae and other tiny organisms to satiate their intense appetites (a feeding apparatus allows for feeding). This means they’re among the most prolific predators on Earth, and likely an integral contributor to the intricate machinations of marine life—a fact that scientists are only now waking up to.